Home / FAQs / FAQ: How are naturopathic doctors educated, trained, and licensed? FAQ: How are naturopathic doctors educated, trained, and licensed? NDs graduate from accredited naturopathic medical schools(four-year, in residence, post-graduate medical programs). In addition to a standard medical curriculum, NDs complete four years of training in clinical nutrition, acupuncture, homeopathic medicine, botanical medicine, physical medicine, and counseling. NDs graduate with hands-on experience diagnosing and treating patients. How are naturopathic doctors educated, trained, and licensed? Accredited naturopathic medical schools are four-year, in-residence, hands-on medical programs consisting of a minimum of 4,100 hours of class and clinical training. In addition to a standard medical curriculum, schools require their graduates to complete four years of training in disciplines such as clinical nutrition, acupuncture, homeopathic medicine, botanical medicine, physical medicine, and counseling. For at least the final two years of their medical program, naturopathic medical students intern in clinical settings under the close supervision of licensed professionals. Given the importance of hands-on, clinical experience for naturopathic medical students, the accrediting body for naturopathic medical colleges does not recognize degrees from online programs of study. The general educational structure for naturopathic doctors is comparable to that of conventional medical doctors (MDs) and osteopathic doctors (DOs). In all three medical programs, the first year emphasizes biomedical sciences such as anatomy and biochemistry. Second-year classes focus on the diagnostic sciences, including areas such as evidence-based medicine and physiological assessment. All programs progressively increase students’ problem-based learning and integrated coursework, enabling students to learn how different concepts affect one another. After the first two years, the curricula of the three medical programs focus on applying medical knowledge to real-life situations with simultaneous classroom studies supporting this training. Third- and fourth-year naturopathic medical students have opportunities for hands-on clinical training and practice, often at their schools’ teaching clinics and off-site clinics. This period of clinical training is essential to these students’ education—so much so that clinical training is now being introduced during the first and second years of education at several AANMC-member schools. As a result, naturopathic medical students graduate with experience in diagnosing and treating patients, even before they begin formal practice. During naturopathic medical school, students are educated in the biomedical sciences as well as the latest advances in science in combination with natural approaches to therapy. They also study disease prevention and clinical techniques. A major difference between the training of the MDs and naturopathic doctors is medical residencies. MD residencies are mandated and regulated by conventional medical schools. As a result, many opportunities for residencies exist at a wide variety of medical facilities and are funded by the federal government. Naturopathic medical residencies are not nearly as common because they are not yet required by most states (Utah is an exception) or funded by the federal government. In place of a residency, many new naturopathic doctors choose to practice with or shadow an experienced doctor before setting up their own practices. Like MDs, a growing number of naturopathic doctors choose to specialize or focus their practices. Specialty associations currently exist for Endocrinology, Environmental Medicine, Gastroenterology, Parenteral Therapies, Pediatrics, Primary Care Physicians, Psychiatry, and Oncology. 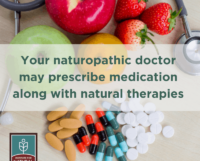 In addition, while practicing Family Medicine, many naturopathic doctors choose an area of focus based on a therapeutic, condition, or population subset. Prior to admission into an accredited naturopathic medical school, the typical entering student has completed three years of pre-medical training and earned a bachelor of science degree. Students are expected to have completed courses in English and the humanities as well as math, physics, and psychology, with a strong emphasis on chemistry and biology. In addition to prerequisite course work, prospective students must demonstrate appropriate observational and communication skills, motor function, intellectual-conceptual abilities, integrative and quantitative abilities, and behavioral and social maturity. College accreditation is issued by the U.S. Department of Education (ED). All AANMC member schools have been accredited or are in candidate status for accreditation by an ED-approved regional accrediting agency. Programmatic accreditation is issued by the Council on Naturopathic Medical Education (CNME). 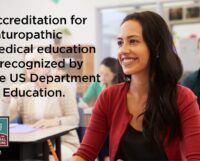 All AANMC member schools have also been accredited—or are candidates for accreditation—by the CNME, the recognized accrediting body for naturopathic medical programs in North America. The exam required to qualify for naturopathic doctor licensure is administered by the North American Board of Naturopathic Examiners (NABNE). The Naturopathic Physicians Licensing Examinations (NPLEX) is a two-part examination. Only students and graduates from accredited or candidate naturopathic programs are eligible to sit for the NPLEX. Passing the NPLEX is required before a doctor of naturopathic medicine can be licensed by a state. Licensure and certification are the highest forms of regulation. They are designed to protect the public by ensuring that certain minimum competency requirements are met. They also set standards for the profession. Currently, 20 states, the District of Columbia, Puerto Rico, and the U.S. Virgin Islands offer licensure or certification for naturopathic doctors. The American Association of Naturopathic Physicians maintains a list of states and territories that license or certify naturopathic doctors. The AANP and the INM would like to acknowledge the Association of Accredited Naturopathic Medical Colleges(AANMC) for its contributions to the content of this FAQ. The AANMC was established in 2001 to advance the naturopathic medical profession by actively supporting the academic efforts of accredited naturopathic medical schools. Who ensures the quality of naturopathic medical schools? 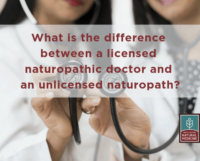 What is the difference between a licensed naturopathic doctor and an unlicensed naturopath?